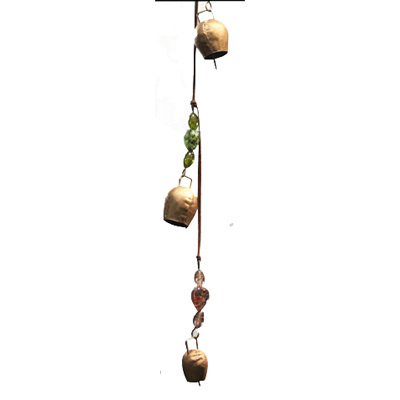 An attractive string of 5 metal bells in the traditional cowbell shape. Hanging on leather 120cm long. 5 pendants of decorated glass beads and bells. Bell diameter varies from 3 to 5 cm. An attractive string of 5 metal bells in the traditional cowbell shape. The sound is reminiscent of Alpine cowherds grazing in the distance! Hanging on leather 120cm long. 5 pendants of decorated glass beads and bells. Bell diameter varies from 3 to 5 cm.